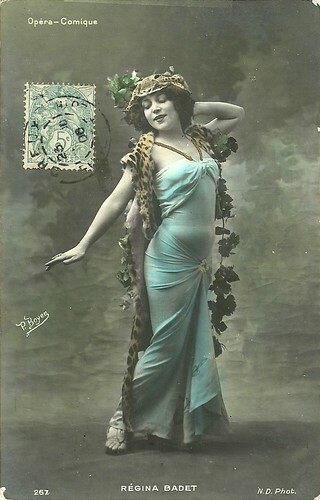 French postcard in the Les Vedettes de l'Écran series by Editions Filma, no. 94. Photo: publicity still for Maître Évora/Mr. Evora (Gaston Roudès, 1922). Anne Régina Badet was born in 1876 in Bordeaux in the Gironde region of France. She made an early stage debut at the Grand Théâtre de Bordeaux where she was a principal dancer in 1890. In 1900 she started a brilliant Parisian career as an actress and dancer. In 1904, Madame Badet became a major star of the Opéra-Comique. 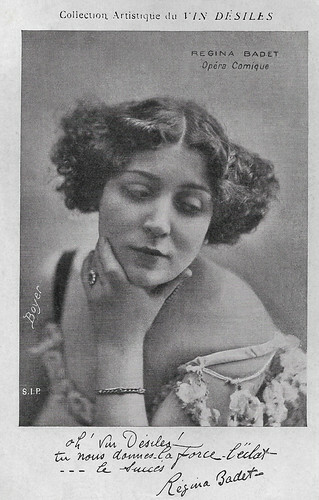 The Los Angeles Herald (1906) described Badet as the 'new Paris pet' and that her dances in the Opera Aphrodite had caused a furor among theatregoers. A critic wrote that he went to see the performance because the opera was a 'masterpiece' and because he wanted to see star soprano Mary Garden's interpretation of her role. Instead, he reported that he was most drawn to the performance by Régina Badet. 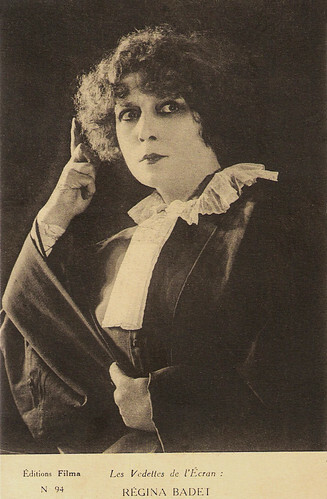 She was particularly noted in 1910 for her role as Conchita Perez in the stage production of La Femme et le Pantin (The Woman and the Puppet) by Pierre Louÿs and Pierre Frondaie. French postcard, no. 267. Photo: N.D. Caption: Régina Badet. Opéra-Comique. 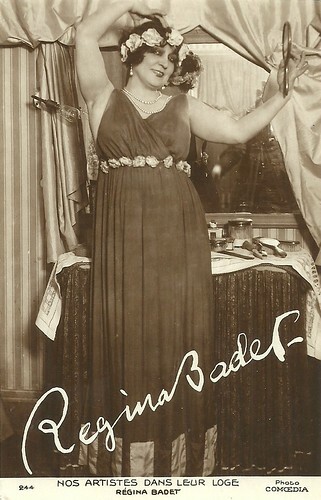 Between 1908 and 1922, Régina Badet played in a dozen films. Her film debut was in the early silent film Le Secret de Myrto/Myrto's Secret (1908) for Pathé Frères. The following year, she appeared for Pathé in Carmen (André Calmettes, Charles Le Bargy, 1909) with Max Dearly. In the next decade she appeared in several films by Louis Mercanton, including Le spectre du passé/The specter of the past (René Hervil, Louis Mercanton, 1913) with Gabriel de Gravone, Vendetta (René Hervil, Louis Mercanton, 1914) with Jean Angelo, and Le lotus d'or/The Golden Lotus (Louis Mercanton, 1916). Her final film was Maître Évora/Mr. Evora (Gaston Roudès, 1922) with Maurice Schutz. She abandoned the stage and the screen permanently in the early 1920s. Régina Badet died in her hometown Bordeaux in 1949. French postcard by S.I.P. Photo: Boyer. Publicity for Vins Désiles. Caption: Oh! Vins Désiles! You give us the force, the sparkle ... the success. French postcard by Editions Lafayette in the Nos artistes dans leur loge series, no. 244. Photo: Comoedia. Sources: Lynn Garafola (Legacies of Twentieth-Century Dance), The Cabinet Card Gallery, Wikipedia (French) and IMDb.